To chip or not to chip. Accidents happen and no matter how careful we are with our pets, they still can go missing. Events like sneaking out an open door or window, break in the fence in the yard, slip off their leash or an open window are just a few. One way to make sure they have better odds of returning is by making sure your pet is wearing an ID tag and is microchipped. As pet lovers, we are big fans of microchipping and want to educate the public the best we can. It makes it so much easier to reunite lost pets with their owners, and over the years has saved so many pets lives and owners a lot of heartache and given them more happy endings. What is a microchip? 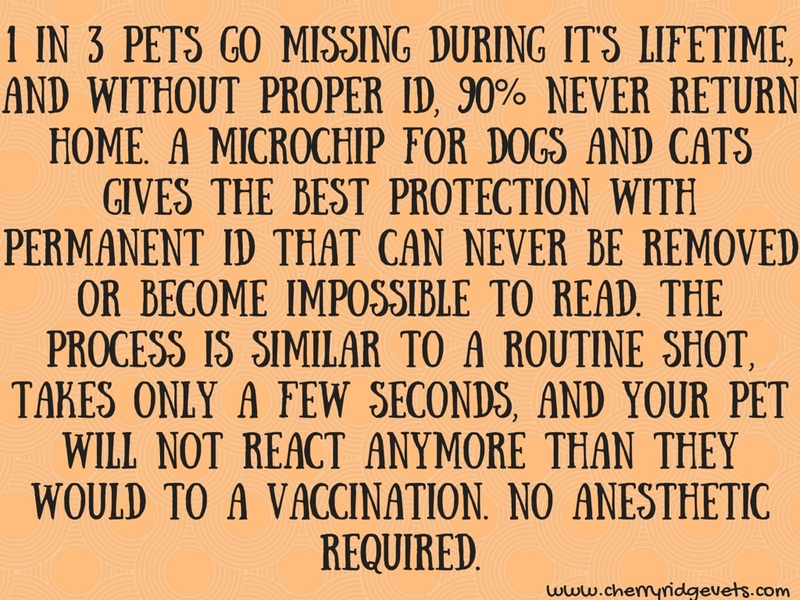 A microchip is a small device implanted under your pet’s skin with a hypodermic needle between the shoulder blades. It is no more painful than a typical injection even though the needle is slightly larger. No surgery or anesthesia is required and the microchip can be implanted during a regular office visit. Often times if your pet is scheduled for a procedure requiring anesthesia like a spay/neuter we will do it at that time. The microchip does not have a battery, it is activated by a scanner that is passed over the area and it emits a low radio frequency that transmits the unique identification code. Microchipping is the most safe and effective way to permanently identify pets. The implant procedure can be performed during admission, wellness exams, vaccinations, and before disposition. A study published in the Journal of the American Veterinary Medical Association determined that the owners of almost three-fourths of microchipped cats and dogs were found due to the presence of a microchip (Source: JAVMA). A microchip can reduce a pet's stay at a shelter to several hours instead of days, saving taxpayers and donors an average of $120.00 per animal in kennel fees. Once implanted, microchips provide proof of ownership that is virtually impossible to remove or alter. If you are unsure if your pet was already microchipped by a previous owner or shelter, ask us to check at your visit. 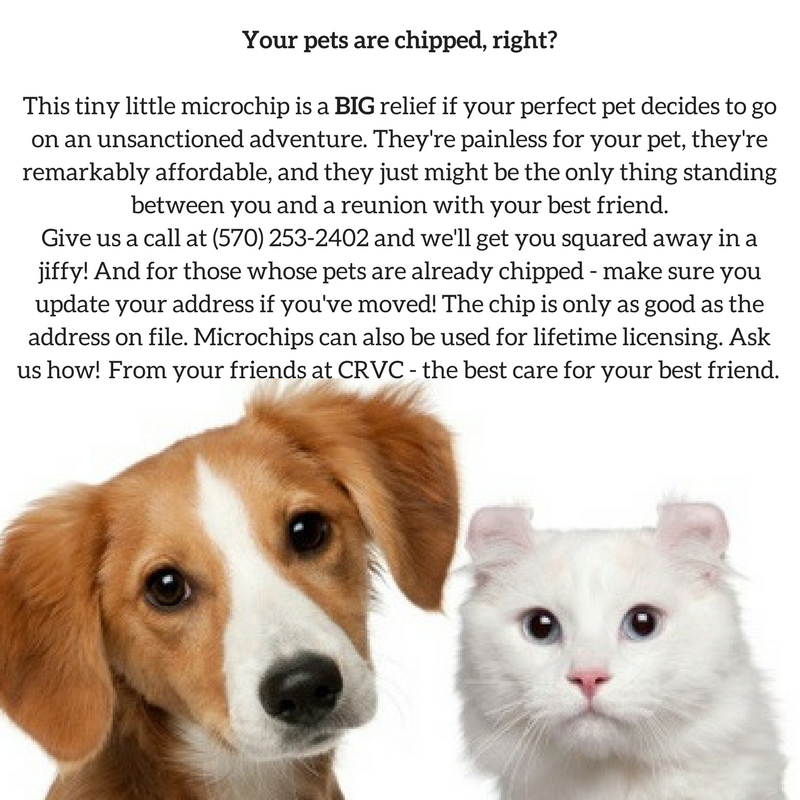 This month we are offering $15.00 off a microchip in the office. Remember the best reason to have your pet microchipped is to improve the chance that you’ll get your pet back if he/she becomes lost or stolen.